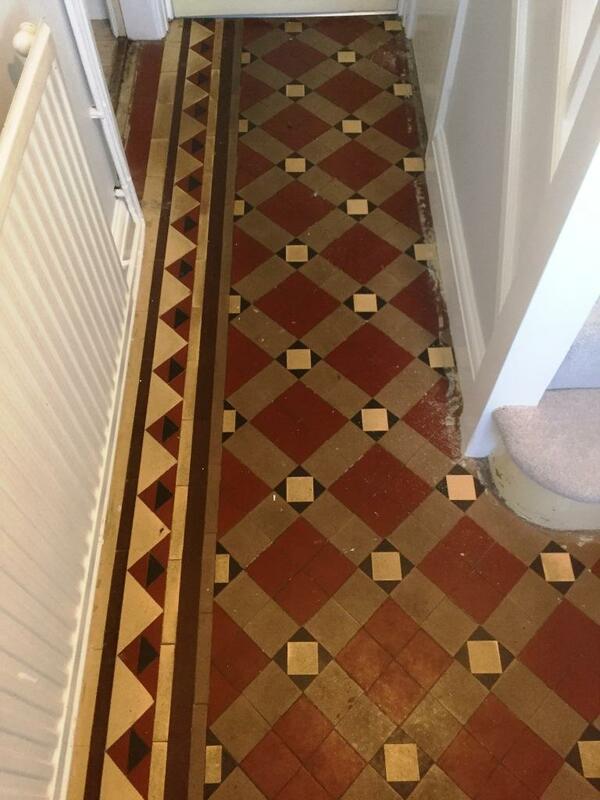 The Victorian tiled hallway shown below had until recently been covered by carpet and was in surprisingly good condition for its age which is a testament to the durability of these floors. My client who lives in Oxford had managed to remove most of the glue that had been used to secure the carpet to the tile but found it had left an imprint on the floor. Unable to take the restoration any further we were asked to remove the ground in grime and seal the floor. My first task was to remove what was left of the carpet adhesive primarily with the aid of scraper which was used carefully along the edges. This removed the thicker parts of the glue but needed more work to remove all the traces; so a 50 grit disc fitted to a handheld machine was run around the edges of the whole floor to complete the job removing the residue and dirt in the process. I then used a 50 grit milling pad attached to a rotary floor machine to remove the ground in grime and clean the whole floor. The floor was then rinsed with water to remove the soil that was generated afterwards and then the process repeated this with a 100 grit and 200 grit milling pad to fully restore the appearance of the tile. This process took up most of the day so before leaving I gave the floor an acid wash using a mild dilution of Tile Doctor Grout Clean-up and then followed this with a good rinse and final clean with Tile Doctor Neutral Cleaner. Having finished cleaning the floor I left it to dry off completely for three days to ensure it was bone dry before returning to seal it. To seal I applied Tile Doctor Colour Grow which is an impregnating sealer that protects the tile from within by occupying the pores in the clay, it also enhances the natural colours in the tile in the process and leaves a matt finish. The finished floor looks a lot brighter now it’s now free of all the dirt and glue marks, the new sealer will also ensure it’s easy to clean and keeps its appearance for some time to come. 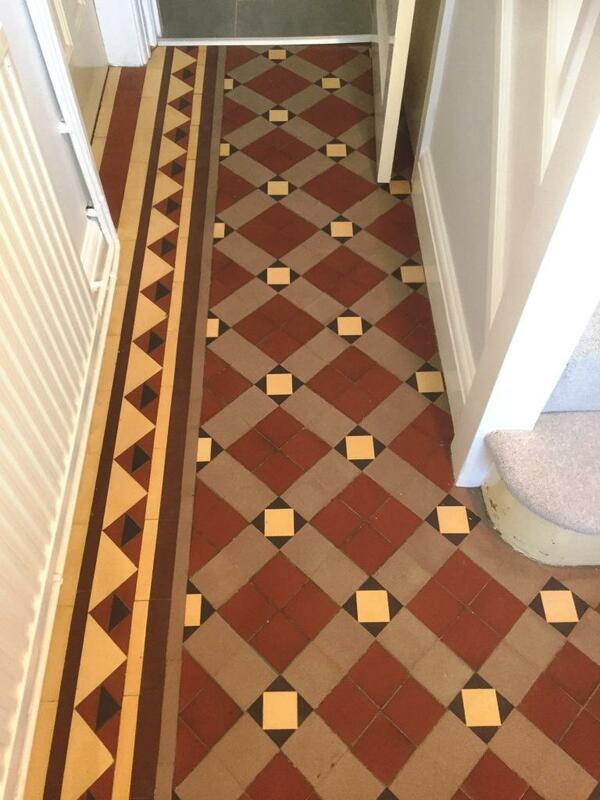 This entry was posted in carpet adhesive, Deep Cleaning, oxford, oxfordshire, removing glue, Restoration, Tile Cleaning Activities, Victoria Tile, Victorian Tiled Hallway, Work History by TileProf. Bookmark the permalink.